South Jersey Radiology Associates P.A. In an unprecedented strategic move to better serve the need of healthcare clients, The Star Group expanded its life sciences vertical to offer clients even greater resources to effectively market brands in today’s dynamic healthcare environment. The expansion began during January 2014 as The Star Group, the largest independently owned marketing communications firm in the Philadelphia region – and one of the top 100 agencies in the United States – merged with the independent agencies VoxMedica (and its parent company, Independence Healthcom Strategies Group/IHSG) and Calcium NYC (a previous joint venture partner) in order to merge both organizations with their existing healthcare agency, Star Life Sciences. The combined group of agencies has entered the market under the Calcium brand name. VoxMedica, with Lorna Weir leading the charge, continues to expand its client roster by providing services grounded in a multidisciplinary approach to marketing and communications that bring value and differentiation to the various stakeholders in today’s dynamic landscape, executives say. The agency was awarded the agency of record assignment for the Merz North America Neurosciences division, relaunching Xeomin and Cuvposa. In addition, the agency handled the expanded launch of Marqibo and was tapped once again by Horizon Pharma to help integrate and launch Vimovo. At Star Life Sciences – with Tim Garde at the helm – 2013 was a year of controlled growth, planning, expanding its digital arsenal, and the launch of the Medical Monitor, a news and commentary service that engages healthcare professionals and consumers to keep them current on all significant healthcare changes in the United States. During 2013, Star Life Sciences brought the ProAir HFA Inhalation Aerosol brand to life on mobile devices for consumers, patients, caregivers, and healthcare providers. As one of the first mobile Web properties in its therapeutic category, the site was recognized by the Digital Health Coalition as an outstanding mobile healthcare site. The brand team was recognized by industry leaders at the 8th Annual Digital Pharma East Conference in Philadelphia during October 2013. The Star Life Sciences relationship with Acro Pharmaceutical Services grew stronger through a series of strategic initiatives designed to foster unprecedented freedom of communication among specialty pharmacies and insurers. 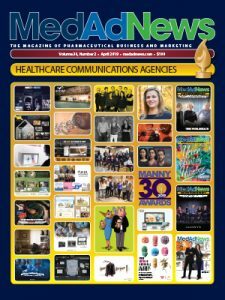 Core Risks Ltd., a consulting firm specializing in the biotech and pharmaceutical sectors, leaned on the agency’s industry acumen and design chops to help blue chip companies up their game in terms of internal communications. At Calcium NYC, with Renee Mellas driving the group, business continued to grow. Calcium opened its doors as a full-service healthcare advertising agency during October 2012, and was promptly awarded its first agency of record assignment – the full line of arrhythmia monitoring devices from CardioNet. Following in rapid succession, Calcium began project work for Avanir’sNuedexta – a novel therapy for psuedobulbar affect. Calcium then began working with the New Jersey-based biotech company Onconova, whose lead product is currently undergoing Phase III clinical development. More recently Calcium was awarded Avanir’s agency of record assignments for AVP-825, a novel migraine product in Phase III development. On the consumer advertising front, Calcium now works with Land O’Lakes, whose Eggland’s Best brand is the No. 1 branded egg company in the United States. On the business-to-business front, Calcium has begun a strategic and creative engagement with J. Knipperand Company, one of the leading healthcare marketing solutions companies. According to agency leadership, Calcium is engineered to do one thing better than anyone else – to grow stronger brands. The management team consists of Lorna Weir, Renee Mellas, Judy Capano, and Steve Hamburg, and is headed up by Steven Michaelson and Tim Garde. Donald Philips, former founder and CEO of VoxMedica, is working with the company in an invaluable advisory role. Calcium is an independent agency operating under Star Life Sciences, making that vertical the second largest within Star Group Communications. Star Group is led by Linda Rosanio, co-founder and CEO. Star employs nearly 300 people nationally in six offices with headquarters located in Philadelphia’s Center City; Voorhees, N.J.; New York; Wilmington, Del. ; Las Vegas, Nev.; and St. Louis, Mo. Star’s most recent ranking places the company in the top 100 agencies in America. The group has begun to merge cultures as well under Star’s Synegration operating model. This model brings clients higher ROI as Star defines it: return on insights, innovation, and ideas. Through the agency’s volunteer platform, VIVA, Vox continues to harness the passion for volunteerism already inherent in the employees at VoxMedica by supporting organizations that serve the city of Philadelphia and health-focused organizations. Star Group’s achievements on behalf of philanthropic organizations and community causes are inspired by Rosanio’s longstanding belief in the idea of sharing success by giving back. Star has helped groups such as American Red Cross, Eagles Fly for Leukemia, The Greater Philadelphia Food Bank, United Way, The American Heart Association, Susan G. Komen for the Cure, Pennsylvania Ballet, Wish Upon A Hero, Garden State Discovery Museum, and World Monuments Fund. In recent years, Star led initiatives to donate items and money for U.S. troops stationed abroad. Following the Southeast Asia tsunami, Star diverted thousands of dollars earmarked for an advertising competition to the Red Cross International Response Fund. As part of Star Group’s 2012 holiday program, the agency donated money to the Hurricane Sandy Relief Fund. This additionally included providing support to the hard hit area of Seaside Heights, N.J., for the company’s annual summer outing during 2013.